The International Federation for Theatre Research’s Embodied Research Working Group (ERWG) held its first official meeting last week at the University of São Paolo in Brazil. Following three days of pre-conference meetings and workshops organized by Matteo Bonfitto, we met six times during the main conference and explored a variety of formats for sharing and analyzing embodied practice and research. At the end of the week we made plans for the future and I was delighted to be joined as convener of the group by Elizabeth de Roza. 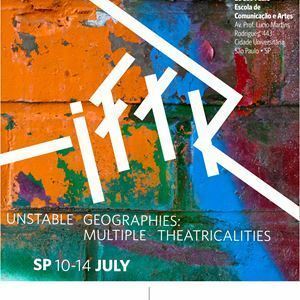 Throughout the IFTR international conference, ERWG members experienced a rich and generous exchange of diverse embodied practices and interweaving research interests involving: connecting – openness – vulnerability – interruption – responsiveness – rootedness – embodied imagining – embodied memory – the haptic – text and the senses – the jelly, the bone and the marrow – multimedia publication and interculturalism. In an atmosphere of curiosity and play, members engaged in a series of workshop sessions and presentations culminating in a dynamic ‘No Table’ event adapted from Lois Weaver’s Long Table. This format offered a kind of improvisational embodied dialogic conversation, a way of being with each other, a space for sharing different viewpoints, for listening and advancing ideas developed over the week through discussion, movement and documentation. This session in particular paved the way for thinking of alternative modes of presentation, documentation and dissemination of work in the future. For more information about ERWG, please visit the official IFTR Embodied Research Working Group webpage. The next annual meeting will take place during the July 2018 IFTR conference in Belgrade. A call for participation will go out in Autumn 2017.